This doesn't strictly related to Silent Computing, but I have a weakness for ultra-cool case mods. Not just the same-old boring case windows but unique, innovative case mods. This guy has built a custom "invisible case" from scratch, using plexiglass and elbow grease. The project took three months to complete and the results are impressive. The article is fairly long and contains a detailed, step-by-step explanation of how he built the case. There are plenty of images at the end of the article to show you the final result. Note: For those of you who like the plexiglass case idea, but don't want to spent 3 months custom-building one, check out this site. Tom's Hardware has reviewed three early versions of the recently-released NVIDIA GeForce4 Series of video cards. ASUS, Creative Labs and Leadtek all sent prototype GeForce4 Ti4600 boards to be put under the microscope. As might be expected from NVIDIA's top of the line model, performance was excellent, trouncing the competition (and NVIDIA's older cards) in every category. Unfortunately, all three cards reviewed have large heatsinks and fans, and from the review, they don't appear to be quiet fans, either. With phrases ranging from "bearable noise levels" to "sound bears resemblance to that of a blow-drier", this doesn't bode well for Silent PC enthusiasts. For now, I'll stick with my fanless LeadTek GeForce2MX. Signum Data's Fanless "SID FutureClient"
Signum Data has recently announced their SID FutureClient, a 2.2GHz fanless PC. According to Signum Data's site, they use a combination of "fluid cooling" and massive heatsinks that make up both sides of the case, to run their computer completely fanless. Unlike many of their competitors, Signum Data seems to have put some effort into industrial design. There computers are more handsome than beautiful, and they won't take anything away from Apple, but they're more than just a plain beige box. They sort of remind me of some of Sun's old workstations. "Quietest Hard Drives in the World"
That's the claim Samsung is making regarding their recently-released SpinPoint series of hard drives. With such bold claims, one has to wonder if Samsung can back them up. StorageReview recently reviewed the SpinPoint P40 model, which is a 7200RPM drive. They found that it was quiet, but not as quiet as Seagate's Barracuda IV. Still, we'd like to know how much quieter one of the 5400RPM drives would be. Read more... (558 bytes more) comments? In these days of multi-gigahertz processors, the juxtaposition of the words quiet and fast seems contradictory. If it isn’t loud, how can it be fast? This exposition tells a little of the history of silence -- or noise, rather -- in computing, its current state and of Silent PC Review's role for the future. This simple project describes how to rig up a switch that will let you feed 5 VDC to your fan(s) for low noise operation, and 12 VDC when more cooling is needed for hot weather or for a bout of serious overclocking ;). It requires only 2 parts: a switch and a male IDE power connector. A soldering iron is recommended but not necessary if you use a switch with screw terminals. It took me less than 15 minutes to build & cost about $2. Tradersworld.com has released their own line of "Whisper Quiet Computers". At first glance, these computers appear to be nothing more than a standard whitebox PC combined with an Enermax PSU and a Fujitsu fluid-drive bearing hard drive. They're geared towards stock traders, so the computers are configured with such niceties as dual monitors and fast Pentium IV processors. However, they appear to be priced at a premium, perhaps more than a simple Enermax PSU and Fujitsu drive warrant. Apple is soliciting feedback from PC users about what might make you switch to a Mac. Apple has been on the leading edge of silent computers, at least among larger computer manufacturers, with products like their G4 Cube and original iMac, both of which are nearly silent. This is your chance to let them know that silent computing is important to you. Zalman has officially released their ZM-NB32J northbridge heatsink. The ZM-NB32J is a passive-cooling system, requiring neither fan nor power. Previously announced at Comdex 2001 Las Vegas, the northbridge heatsink is primarily geared towards the overclocking crowd. 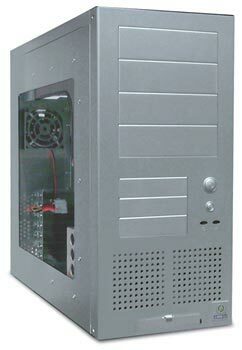 Along with the CPU heatsink-fan and the power supply unit, the hard drive is a major PC noise source. It whirrs and whines just idling, and clatters and grinds when in seek or write mode. There are many ways to reduce hard drive noise. The simplest of these is to use one that is quieter. But even the quietest hard drives make some noise and vibrate, so drive silencing is useful in most PC noise reduction projects. What is Your Noisiest PC Component?